It's a complete nightmare for them. On Thursday, a 43-year-old captive female elephant died in Vietnam. The elephant - named Na Lieng - was forced to work in the tourist industry, giving "holidaymakers" rides on her back. She likely died, Thahn Nien News reported, from exhaustion. Sadly, the animal's death wasn't an anomalous event. In March, a 40-year-old captive male elephant also died from severe exhaustion and overwork in the tourism industry, according to local news reports. A 36-year-old male elephant collapsed in January for the same reason: he was found dead with chains still on his front leg. In 2013, two female elephants also died in Vietnam - again, from overwork and hunger. There are a mere 55 captive elephants left in Vietnam, according to Dr. Pham Vanthinh, a veterinarian from Vietnam's Dak Lak Elephant Conservation Center (DECC), and they are literally dropping dead from their suffering. Almost all of them experience stress and exhaustion from overwork by their owners and tourist companies, Vanthinh told The Dodo. 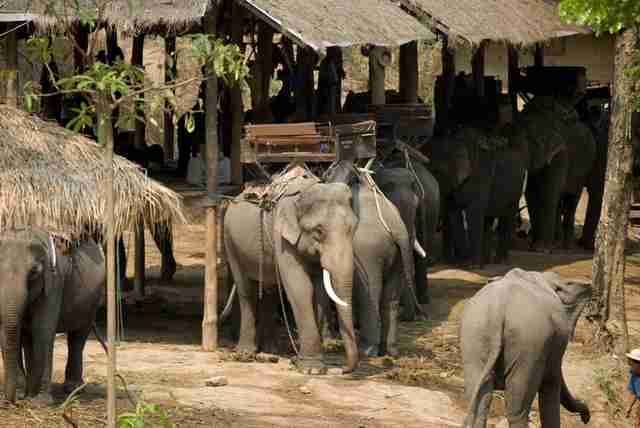 "Tourists go to Dak Lak [region] to see and ride elephant. 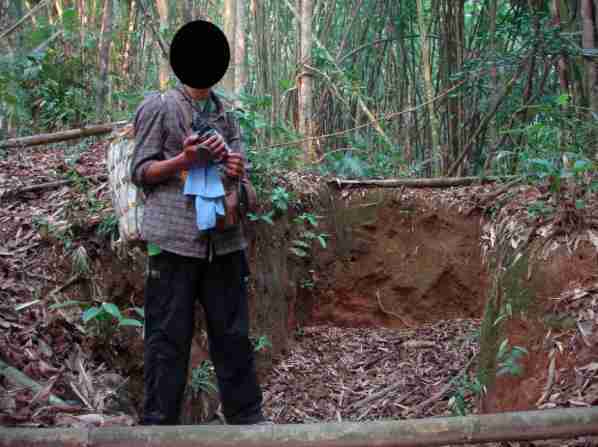 [They] will give lots [of] money to the owners, so domestic elephants in Vietnam have to work all day," Vanthinh says. "All owners will [bring the elephant] into the forest at night and take them to work the next morning." But in the dry season, he adds, the situation gets even more troubling as they grow weak from lack of food. And then, in some cases, die. Vietnam has just a sliver of the thousands of the some 12,000 (or more) captive elephants in Asia - many of whom struggle in the same desperate reality. Altogether there are approximately 38,000 to 50,000 Asian elephants globally, and they are listed as "endangered" on the IUCN Red List and under Appendix 1 on CITES. Beyond Vietnam, elephants are used for tourist rides, or "treks," in a jamboree of other nations including India, Sri Lanka, Laos, Cambodia, Indonesia and Thailand, which is arguably the hot spot for elephant tourism in the region. In 2010, World Animal Protection documented the conditions for captive elephants in Thailand in its report "Wildlife on a Tightrope." 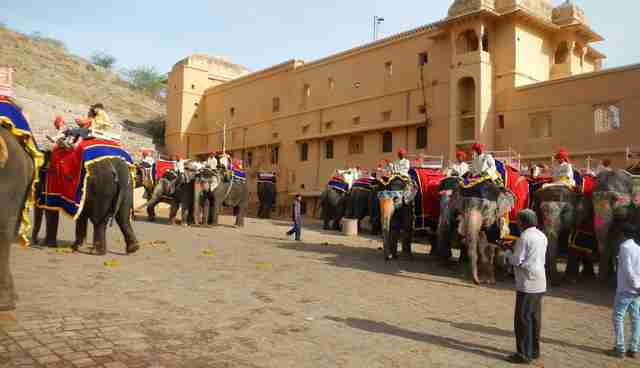 The organization surveyed 1,688 captive elephants in 118 venues across the country, most of which offered elephant rides or shows. According to the report, more than half of those elephants were in terrible conditions. They were bound by "extreme" restraints. They were unable to socialize with other elephants. They did not receive veterinary care. And for those who suggest that the treks instill any kind of conservation ethos, World Animal Protection found only 6 percent of the venues promoted educational components with the treks. "Cruelly taken from the wild or bred in captivity," the report reads, "these elephants are separated from their mothers and family groups at just a few months old. Elephants destined for the tourist industry experience great physical and mental trauma. Isolation, starving, hitting and beating are just some of the methods used to initially break their spirits and get them to behave and perform." Dr. Jan Schmidt-Burbach is the senior wildlife and veterinary adviser at World Animal Protection and is based in Bangkok. 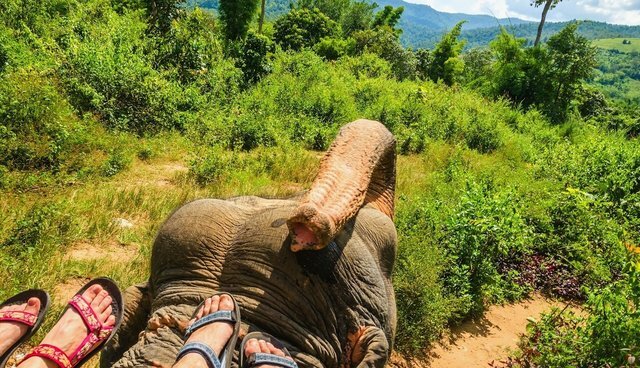 "Tourists may think activities like riding an elephant do no harm," he told The Dodo. "But the brutal truth is that breaking these animals' spirits to the point that they allow humans to interact with them involves cruelty at every turn." The spirit-breaking Schmidt-Burbach refers to isn't colloquial: It's a method. In 2002, National Geographic aired one of the first highly publicized accounts of what's commonly referred to as the "training crush." In the graphic video, which can be found here, men beat and terrorize a wild-caught baby elephant in a cage over the span of days in order to crush his spirit - and ready him for a life in the tourism industry. There are other methods to beat young elephants into submission. According to a 2014 Traffic report, "An Assessment of the Live Elephant Trade in Thailand," wild elephants are also caught and forced into captivity through the "pit trap:"
Several methods are traditionally used to capture wild elephants, for example the "pit-trap" method, whereby a herd is corralled using domestic elephants, into a corridor where a pit has been dug. However, these methods result in high elephant injury and mortality rates ... Mothers and female minders are often extremely protective of wild infants they are guarding, making it difficult for the poachers to capture them. Using automatic weapons, the protective members of the herd can be easily be killed and the infants removed. The body parts from the slain individuals can then also be sold for profit. It's unclear how frequently the "crush" or pit-trap process occurs, but the market for baby elephants in the captive industry is robust. According to the Traffic report, the market value for a healthy baby elephant is $33,000. The ramifications of seizing elephants from the wild and thrusting them into the captive industry are very significant, according to Simon Hedges, co-chair of the IUCN/SSC Asian Elephant Specialist Group. Hedges told The Dodo that "one of the main threats to elephants in their main remaining habitat blocks in Thailand is ... the illegal captures for the trade in live elephants." One of the reasons that the proliferation of captive elephants in Thailand is able to thrive is a technical difference in how wild and captive elephants are legally identified in the country. Wild elephants fall under the Wild Animal Reservation and Protection Act of 1992 (WARPA), which affords particular protections and penalties if someone is caught killing a wild elephant. But once the animal enters the captive system, it's different: Captive elephants are covered by the Draught Animal Act of 1939. According to the Traffic report, captive elephants in Thailand are basically categorized as livestock. Given the potentially brutal training process, combined with well-documented science and observations about elephants' emotional depth, cooperative nature, familial bonds and intelligence, why, then, do tourists who travel to Asia still want to ride elephants? World Animal Protection conducted another survey in 2014. That survey found nearly 50 percent of travelers "pay for an animal experience because they love animals," said Schmidt-Burbach. Those tourists might be shocked to know that in some cases, the animals are indeed being treated very poorly. "When you see a captive wild animal on your holiday, you often can't see the cruelty," Schmidt-Burbach says. "It's hidden from view. And it's important to remember that a captive wild animal in the entertainment industry can never truly experience a life free from suffering and cruelty." For some tourists, sitting atop the world's largest terrestrial mammal is supremely positioned on the travel bucket list. For others, only ignorant jerks would even consider such a reprehensible joy ride. 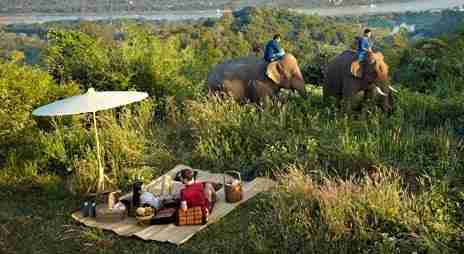 But for those straddling the proverbial fence, the messages can be confusing: Some travel magazines pen the praises of elephant camps and their mahouts, like this article about Laos in Travel & Leisure. On the other hand, some travel companies have omitted elephant treks from their itineraries altogether. Intrepid Travel, which it says handles some 250,000 travelers annually, cut elephant treks from all 30 itineraries in January 2013. Christian Wolters, deputy general manager of Intrepid Travel, told The Dodo that the decision has had enthusiastic support and as a result, "2,500 people per year no longer participate in elephant rides." But on the ground in countries like Thailand, there is often a more nuanced perspective on tourism, elephant rides and ethics - that only those who are actually working with the elephants can provide. Roberts has been working in Thailand with elephants for 13 years and suggests that the debate isn't as simple as ride-or-don't-ride the elephant. He says that mahout culture demands that generation after generation of men in certain families own elephants, and "elephant need 400 lbs of fodder a day, families need to live, and so mahouts use elephants to make money - and currently tourism is the only option." Tourist camps, Roberts says, run the gamut: "from huge 'factory' camps with no thought for elephants' needs and welfare, to camps where elephants are well kept and the mahouts are provided with all the tools they need to help elephants." Roberts points out that in Thailand, the elephant trek industry is actually growing, but not necessarily the camps like Anantara. "New 'camps' [are] opening up almost weekly in the beach resorts and islands of Thailand as well as spreading to our Asian neighbors," Roberts notes with concern. He worries that more mahouts will be forced to find work in the new factory-style camps. As long as the captive industry continues, the question for Roberts is: "How can we use tourism ... to look after the captive elephants as best we can, while giving mahouts the tools and opportunity to treat their elephants well?" The mahout culture is also a very critical component to the story in India, says Geeta Seshamani, co-founder of Wildlife SOS, an organization that aims to halt the abuse of wild and captive animals within the country. India is another popular destination for elephant treks. "A mahout can directly improve or deprive the welfare of elephants in his care," Seshamani told The Dodo. "Being a part of the problem, he has to be a part of the solution as well." In India, explains Seshamani, the traditional methods of mahout training use "the principle of beating the elephant to create 'fear of the mahout' so the relationship between the elephant and the mahout is one of master and slave where the elephant receives pain and lives in constant fear, thereby lashing out at his master seeking revenge at an opportune moment." 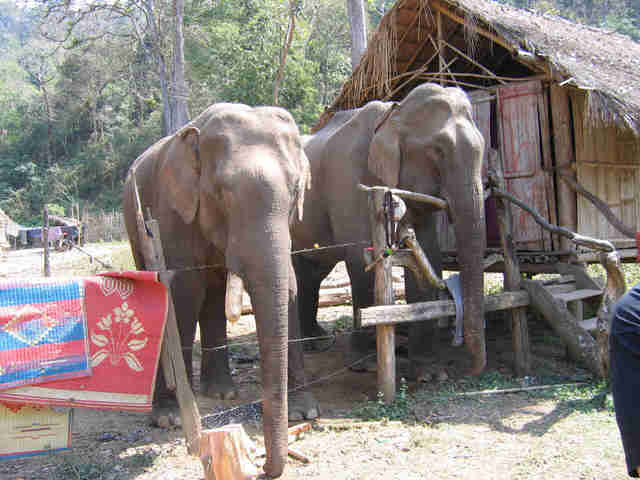 Wildlife SOS, says Seshamani, is establishing a mahout training school in India that will help mahouts "move away from the risky, inhumane and cruel traditional methods towards scientific, positive and safe methods of elephant management." The organization has also launched the Captive Elephants Welfare Project, which provides veterinary care for elephants and encourages mahouts to find alternative livelihoods. Still, Seshamani says that until the demand for the elephant rides diminishes, there will always be the cycle of abuse. There are some 3,500 captive elephants in India and the majority of them are used for elephant rides by Western tourists, she adds. And the conditions can sometimes be deplorable: Walking on hot, tar roads. Trained with spiked chains and "ankush" (bullhooks). No veterinary care. Dehydration, cracked feet and abscesses. Being shackled for long periods in the heat. "We believe that if Western tourists stop being customers for elephant rides, this will immediately change the scenario and improve the welfare and lives of elephants across India," says Seshamani. Or, as World Animal Protection's Schmidt-Burback puts it: "Our advice is simple: If you love wild animals, view them in their natural habitats."